A pumpkin cooler is the perfect seasonal craft for a Halloween, Thanksgiving or fall party! Follow these simple steps to make your own pumpkin cooler, perfect for keeping bottles of beer or wine chilled at your next party. When selecting a pumpkin for your pumpkin cooler, be sure to pick a pumpkin that's large and wide, as it will give you more space for your bottles. To start, thoroughly wash and dry your pumpkin to remove any of the dirt on the exterior. Draw a line around the center of the pumpkin. One easy way to get a nice straight line is to place a large elastic band or headband around the top of the pumpkin and use a marker to trace a line just above the elastic. Using a kitchen knife, cut the top of the pumpkin off, following the marked line. If there are any remaining marker lines after you are done cutting the pumpkin, wipe them away using a paper towel or dishcloth. Take a spoon or ice cream scooper and remove all the seeds and pulp from within the pumpkin. You may wish to set aside the pumpkin seeds in a small bowl to roast later. If the interior of the pumpkin is small, use a spoon to scrape away at the interior edges of the pumpkin–this will make the opening larger so that you can fit more bottles inside. Shortly before your guests arrive, line the interior of your pumpkin with a small trash bag or large glass bowl so that either the bag or the bowl goes inside the pumpkin but is not viewable once the pumpkin is filled with ice. This step will help to protect your table as it will help prevent your pumpkin from leaking water from the melting icing by collecting the water inside the bag or bowl. 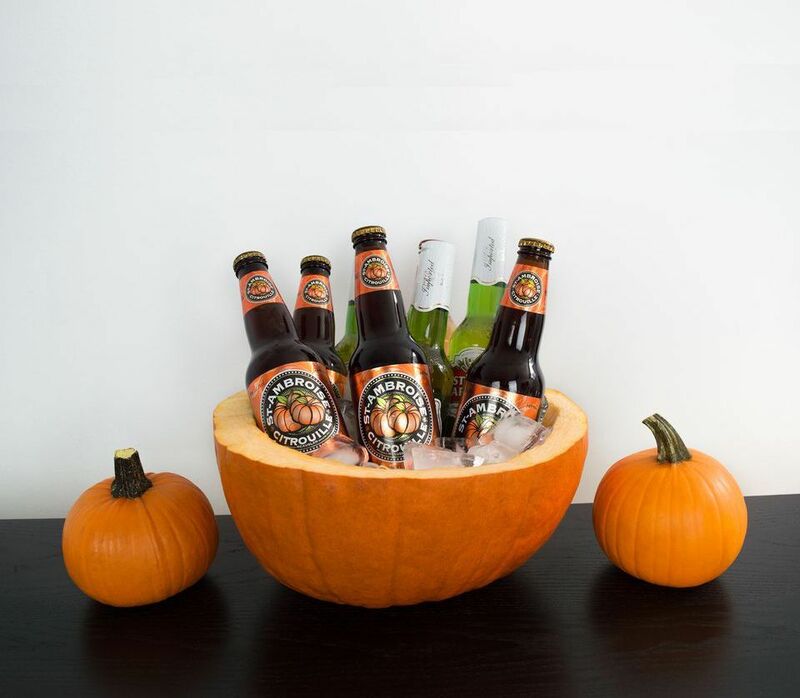 Finally, fill the pumpkin with ice and stick in either several bottles of beer or wine into your cooler. Bottles of pumpkin beer would be a particularly good choice to continue the pumpkin theme. The pumpkin does a remarkable job insulating the coldness, which will keep your drinks cool throughout your party. After the party is over, remove the bag or bowl with the remaining ice and dispose of the pumpkin.